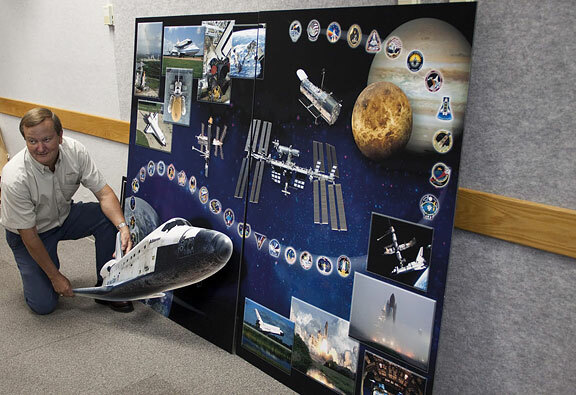 A new 3 D tribute commemorating spectacular highlights from the historic missions of Space Shuttle Atlantis now proudly hangs high inside Firing Room 4 of the Launch Control Center at NASA's Kennedy Space Center. The huge mural was created by the NASA and contractor teams that process Atlantis in preparation for blasting off to the High Frontier. 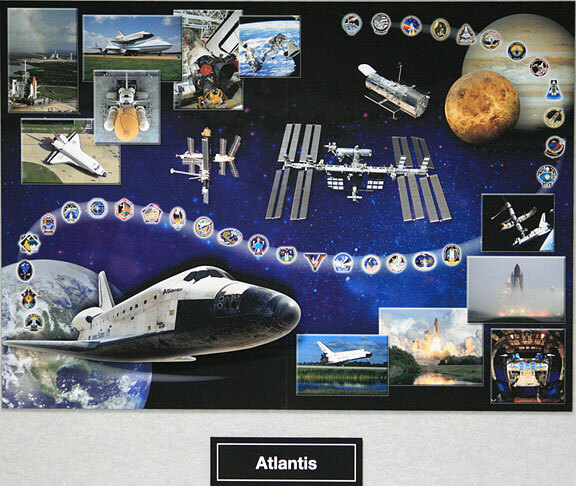 The teams themselves, not outside artists, created the collage from objects and images highlighting significant milestones in the steps to check out and prepare Atlantis for launch and events from her 32 actual missions to space. 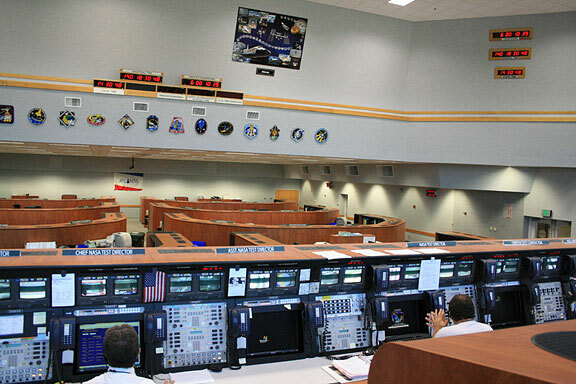 I was fortunate to go on a rare media visit this week to the interior of Firing Room 4 at the Launch Control Center, from which the direct command is given to launch the manned shuttle vehicles into space. 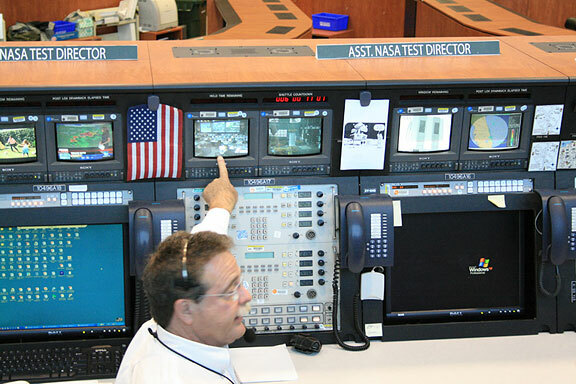 This is the location which television and web viewers see during the countdowns and shows the NASA Launch directors and controllers sitting at their computer consoles as they monitor all launch related systems vital for safely conducting a space lift off. "The mural was hung on the wall a week before the launch of STS 132, in time for the last scheduled launch of Atlantis", NASA Public Affairs Officer Candrea Thomas told me during the visit. "The processing teams came up with the concept and design themselves, and put a lot of thought and effort into it". "Likewise, the teams currently working on Discovery and Endeavour are also preparing murals for those orbiters. Shuttle Launch Director Mike Leinbach is leading the effort on murals for Columbia and Challanger. People who worked on those two orbiters will assist Leinbach. NASA hopes to have all five murals completed and ready for display around June", added Thomas. NASA Test Director Tim Potter and other orbiter test conductors present during my visit explained the duties of the console personal closely monitoring various shuttle flight systems, payloads, orbiter and range safety, cryogenics loading, medical, weather, landing and more in the Firing Room. 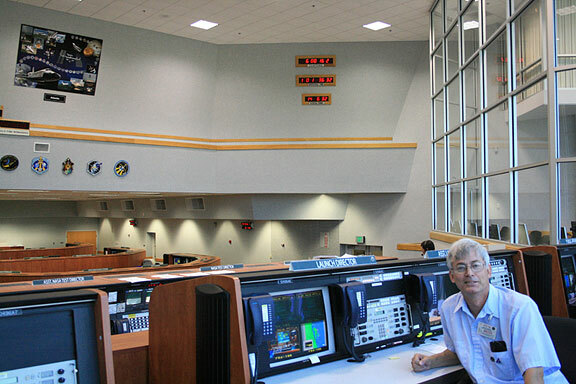 "The Launch Director [Mike Leinbach] is in charge of everything, monitors the overall situation and makes the ultimate decision to continue or stop a launch", he said. "About 125 people who are systems experts are involved and at console in Firing Room 4 during a launch countdown," Potter told me. 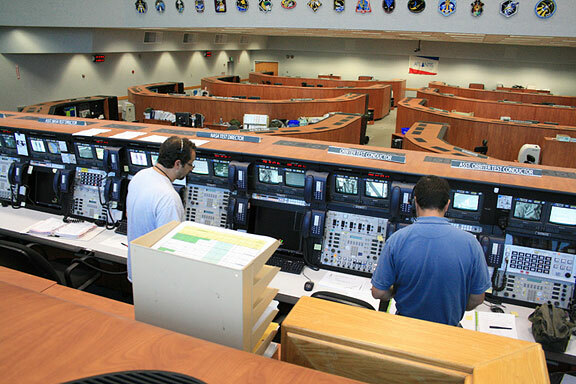 "They staff the command and control consoles for three shifts around the clock. Other NASA management and observers, not directly involved in the 3 day countdown, sit in walled off bubble rooms off to the side where they can monitor but not control the launch proceedings." "Everything operates according to the launch commit criteria. If anything is out of order in the last few seconds, we do an automatic abort. We control all the steps in the processing flow and launch until the shuttle clears the tower about 1 second after ignition of the Solid Rocket Boosters. Then we hand off control to Houston." "We operate under the philosophy that it takes the whole room to say 'GO'. It only takes 1 person to say 'STOP'. Anyone can say 'STOP' right down to T-ZERO", explained Potter. Atlantis and NASA's entire fleet of shuttle orbiters were named after pioneering sea vessels which established new frontiers in Mankind's scientific research and exploration. Construction of Atlantis began in 1980. "Atlantis arrived at Kennedy in April 1985," says NASA Public Affairs Officer George Diller. "Workers spent 7 months preparing the vehicle for the maiden voyage". 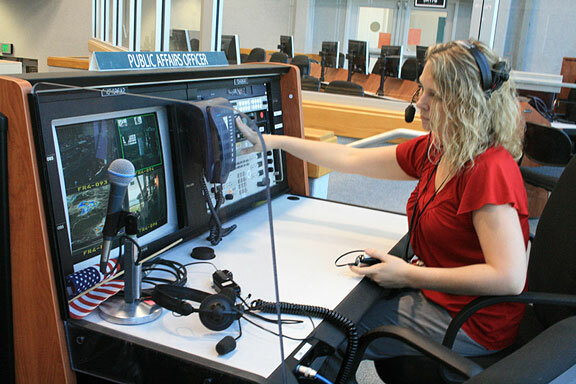 Diller has done shuttle launch commentary at KSC for NASA TV for more than 20 years. Upon her first launch in October 1985, Atlantis was the fourth orbiter to lift off from the Kennedy Space Center. She is named after the two-masted, 460-ton research vessel operated by the Woods Hole Oceanographic Institute in Massachusetts, from 1930 to 1966 and was the first US vessel to be used for oceanographic research. Atlantis has carried on the spirit of a 'Sailing Vessel for Science' by launching several legendary Interplanetary and Astronomy probes including the Galileo Jupiter Orbiter, the Magellan Venus Radar Mapper and the Compton Gamma Ray Observatory. Atlantis then went on to conduct the breakthrough docking to the Russian Mir Space Station in 1995, the first ever by a space shuttle. Six follow on dockings of Atlantis to Mir were absolutely crucial for paving the way towards the international cooperation essential for conceiving and developing the International Space Station (ISS). In 2009, Atlantis was utilized to conduct the final servicing flight by humans to completely rejuvenate the iconic Hubble Space Telescope to the absolute apex of its scientific capabilities. The center of the mural is dominated by the two earth orbiting space stations, Mir and the ISS, which Atlantis visited. Atlantis played a key role in helping to construct and maintain the ISS with deliveries of pressurized habitable modules and airlocks, massive solar arrays and other station segments, science research equipment, assorted supplies and gear, as well as more than 200 astronauts and cosmonauts for multiple countries of Earth. The mural is adorned with all 32 mission patches and large photos of Hubble, Jupiter and Venus. Check out my Atlantis STS 132 launch and mission reports here.